Setting up a server for a contact form is annoying. You love your static site, but you don't want to deal with setting up a server application just to post a form. Wouldn't it be nice to have a way to get feedback from your users without all that hassle? 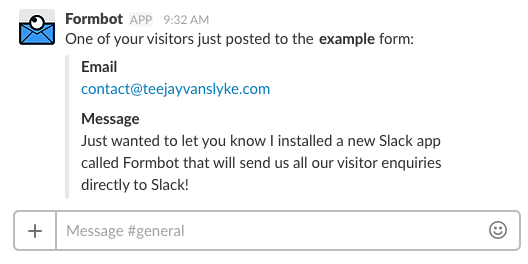 Formbot alerts you when your visitors submit your contact form. Formbot costs $9 per month for unlimited form submissions across unlimited sites. Formbot has built-in spam prevention. Include a non-human-readable form field to your form and tell Formbot about it. If a bot fills the form, it'll be ignored and you won't be bothered. I'm Teejay VanSlyke, a developer in Portland, Oregon. I love using static site generators like Jekyll and Middleman, but found myself out of options as soon as I wanted to add a form. I built Formbot specifically for adding a contact form to my own site, and hope your sites will benefit, too! Sign up below for a risk-free 30-day trial. You'll be up and running in minutes.